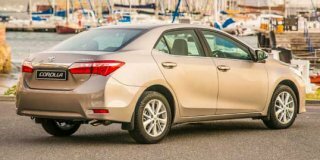 Toyota Corolla range gives the driver an experience and sensation of the dynamic drive. With the advanced modifications and fuel efficiency starting at 4.5L/100km, you’ll save fuel even when you accelerate ahead. You have the option to choose from the 1.3 litre petrol, 1.6 litre petrol, 1.4 litre diesel or the 1.8 litre petrol engine. Enjoy performance and fuel efficiency in the Toyota Corolla by maintaining and a select and constant speed.